ISKCON Temple, popularly known as Radha Krishna Temple is a Hindu temple located in Chennai city of Tamil Nadu. 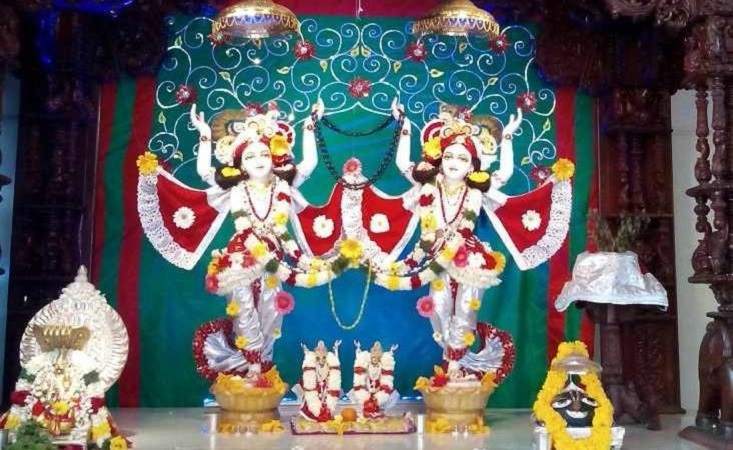 This temple is built and managed by Iskcon society who have more than 40+ temples in India. It is located on Hare Krishna Land in Sholinganallur area of the city. It has deities os Radha Krishma, Lalita, Vishaka, Jagannath, Baladev, Subhadra and Sri Sri Nitai Gauranga. It is also known as Sri Sri Radha Krishna Temple. It is one of the most visited temple of Chennai city and thousands of people visit this temple on regular basis. Janamashtami and Ratha Yatra are the main festivals celebrated here. ISKCON society built this temple on an area of 1.5 acres and it is the largest Radha Krishna Mandir in Tamil Nadu state. Land for the temple was chosen in 2000 and construction for the same was started in 2002 with the donation money received from the devotees. The official inauguration of the temple was done on 26 April 2012. Temple building is spread on total 5 floors. The temple complex has some other building and shop for the convenience of devotees. Sri Sri Radha Krishna Kalyana Mandapam is a dining hall located on the ground floor of the building. A dining is also situated in the basement. Book and gift shop is also situated here. A Pure vegetarian restaurant named Shuddha Sattva is located in the temple complex serves delicious food. Restaurant Timings are 9:30 AM to 3:00 PM and 5:00 PM to 9:15 PM. Rooms in the temple guest can also be booked by contacting the temple officials. 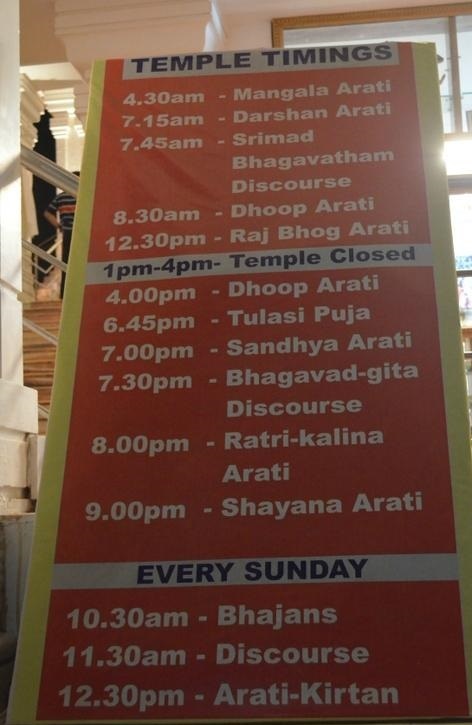 Chennai ISKCON temple opening time is 4.30 in the morning with Mangala Aarti and closes at 12.30 in the noon with Raj Bhog Aarti. The temple remains closed in the afternoon from 12.30 to 4. At 4 it opens with Dhoop Aarti and Closes at 9 in the night Shayana Aarti. Multiple Aarti, Bhajans and kirtans are the part of the daily schedule in this temple. On Sunday, some other activities are also performed in the temple. There is no entry fee in the temple. Temple daily schedule and at timings is displayed below. It is located in the Sholinganallur area of Chennai. It is little far from the centre of the city and the Chennai railway station is around 25 KM from here. The place is connected with all the parts of the city, however, public transport connectivity is not good in this area. Reaching here through own vehicle is more convenient. Car parking is available here and it is chargeable. Shoes are not allowed inside and they can be deposited at the shoes deposit counter. Camera are allowed, however, clicking pictures are prohibited. Drinking water and toilets are located here. I hope this information will surely helps the devotees to plan a visit to Iskcon temple of Chennai.